While children across the United States are counting up their Halloween candy today, nearly 21 million of them, and their families, are experiencing a reduction in their monthly food stamp benefit. That’s because a temporary benefits increase provided under the American Recovery and Reinvestment Act (ARRA)—the economic stimulus package created to respond to the Great Recession—expires today. The Supplemental Nutrition Assistance Program, previously and commonly known as food stamps, provides a monthly benefit to help low-income families purchase food. As of July 2013, SNAP provided food assistance to 47.6 million people in 23.1 million households. The average benefit across all families was about $273 per month. It is no secret that SNAP played a vital role in assisting families during the recession. SNAP enrollment increased by about 80 percent during the recession. 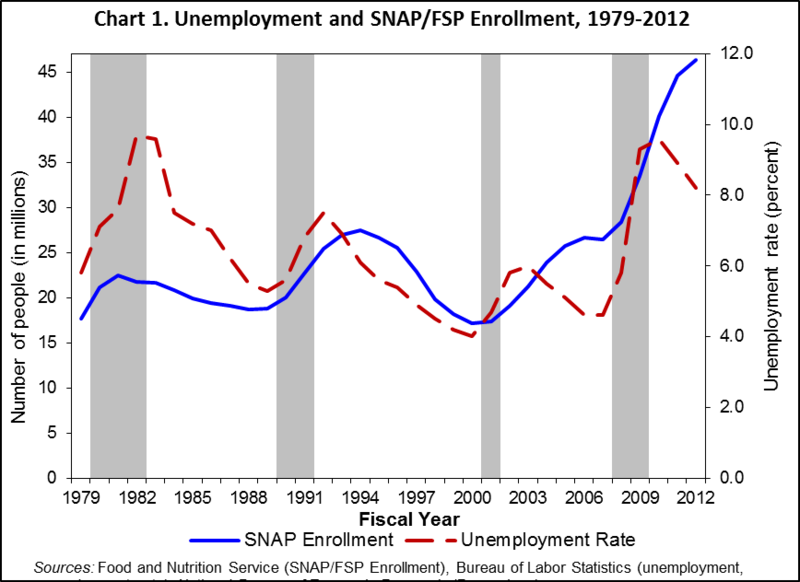 That SNAP would grow during the recession is not surprising as SNAP enrollment has generally followed the unemployment rate, dating back to the 1970s (see chart 1). What stands out is a particularly sharp increase beginning in 2007, coinciding with huge spikes in unemployment and the start of the Great Recession. Part of that increase reflects SNAP’s role as an “automatic stabilizer,” supporting families when hard times hit. As families saw their incomes drop (or vanish entirely) during the recession, more became eligible for assistance. In addition to this automatic response feature of SNAP, ARRA expanded opportunities for Americans to receive food assistance--and temporarily increased benefits by an average of 15 percent per family. This amounted to an $80-per-month increase for a family of four receiving the maximum benefit amount back in 2009. 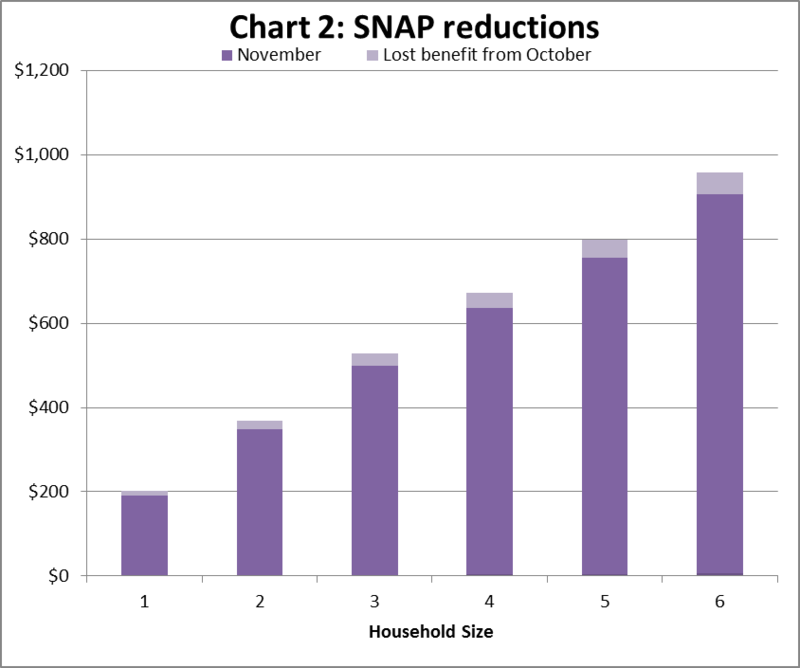 Unfortunately for families who are enrolled in SNAP today, these extra dollars are riding off into the ARRA sunset. According to the USDA, a family of four receiving the maximum benefit sees their monthly benefit decrease by $36 today, or about 5.4 percent of the total amount, and benefits are falling for households of all sizes (see chart 2). Under the USDA’s “Thrifty Food Plan,” this reduction is equal to about a week’s worth of meals for a 9-year-old child. Source: U.S. Food and Nutrition Service. Cost of Living Adjustment. Note: The entire bar is the October benefit for a family. The lighter section of the bar is how much benefit is lost due to the ARRA expiration, and the darker section is what remains for a family in November.